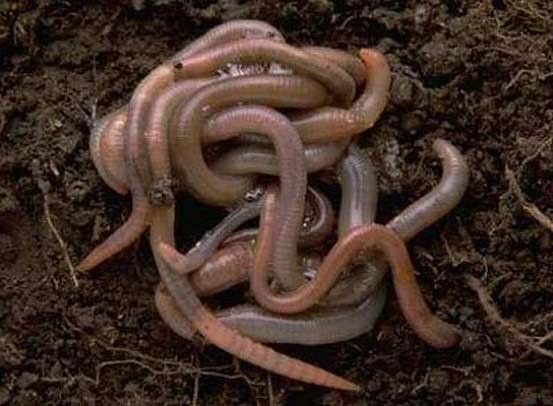 Last week we told you how beneficial earthworms are to our soil, lawn and landscape. This week we have another garden task for earthworms – vermicomposting! It is very similar to outdoor garden composting in that you add kitchen scraps to a compost bin to break it down; but in vermicomposting, it’s the worms that do the work by consuming and breaking down all of your kitchen scraps. Your scraps will be turned into nutrient rich humus that is excellent for landscape and container plants, especially in the vegetable garden. Best part, you can vermicompost year-round. First you’ll need a bin. A large plastic storage container with a lid and holes drilled into the bottom and sides for drainage and air circulation is just fine. Set up multiple bins in various sizes if you have the space. Or, look online for ideas on building a custom bin out of wood. A cover is important as it provides darkness for the worms and keeps in moisture. You can also purchase pre-made vermicomposting bins. Soak shredded newspaper in a container of water until it is soaked through. Then squeeze out as much water as possible so that it is very moist, but not soggy. Add it to the bottom of your bin and fluff. This is where you’ll house your new worms. If the bedding dries out, mist with water. Red Wigglers get a new home. The worms used in vermicoposting are not the same as the ones you find in your landscape. In worm composting, we prefer to use Red Wigglers. You can find them online or order them locally from our friends at Texas Worm Ranch. You’ll need about 1-pound of worms per ½ pound of waste that you think you’ll add. Fruits, veggies, coffee grounds (with the filter), pasta, dry, crushed eggshells and cornmeal added for grit to aid in digestion, are all good starts. Avoid meats and greasy foods. Start slowly to avoid bad odors; once worms start feeding you can add more quantity. Spread a thin layer of scraps and cover with a thin layer of bedding. Do this weekly adding a bit more each week. Dampen the layers as you go. Never let them dry out. When is your fresh compost ready? In 3-4 months, your first batch of compost should be ready for the garden. To remove, shine a bright light in the bin. The worms are repelled by light and will move to the bottom. Once they’ve moved to the bottom, scoop out your compost and continue building more with scraps and bedding. Compared to regular soil, worm castings contain 5 times more nitrogen, 7 times more phosphorus and 11 times more potassium that will all greatly improve the structure of the soil. Need more info on making your own worm compost at home? Visit our Pinterest board Composting At Home for more tips and tricks. Ask us questions on Facebook or Tweet us @soilsalive.